In the personal weather station industry, there are dozens of consumer products designed to make weather instruments a catchy and usable household gadget. Have you ever dreamed of owning a high-quality and caliber weather-telling machine? Many of these professionally-grade weather stations are equipped with the same technology meteorologist use to craft the daily weather report. In the weather instrument industry, one of the most reputable companies is Davis Instrumentals. With over 50 years’ in the industry, boasting experience, quality, and the best innovative weather instruments on the market, we were intrigued and felt the need to review one of their products: The David Instrumentals 6250 Vantage Vue. In today’s article, we are going to highlight some of the most important characteristics and features and some cautionary measures. At the end, we will offer our professional feedback and advise regarding whether this weather instrument is worth the money, or not. Shall we begin? The Davis Instrumentals 6250 Vantage Vue is a stronger competitor, providing some of the most accurate weather data. In fact, while the Vantage Vue is considered a beginner’s weather instrument, it’s built with some of the most advanced and innovative pieces of technology. If you are new to the weather instrument industry, it’s incredibly important to pay close attention to the materials used to build a weather instrument. On the market today, the Davis Instrumentals Vantage Vue is considered one of the best built weather instruments for it’s price range, touting longevity and durability. Another significant advantage of the Davis Vantage Vue is that this machine is incredibly reliable. The Davis Instrument Vantage Vue comes with the option of purchasing WeatherLink, which allows users to track data from the console and transfer it to their computer. The WeatherLinkIP add-on has some unique features, including some great graphics to help understand the information. The Vantage Vue is compatable with the Vantage Pro 2, which makes it easy to mix components to perfect your weather instrument. The biggest downside to the Davis Instrumentals Vantage Vue is that, in order to equip the weather instrument with internet connectivity, the consumer must purchase that hardware separately. The Vantage Vue comes with a 5-in-1 sensor package, which helps boast accurate data; however, the inability to adjust or move the anemometer makes it difficult for consumers to get the BEST and most PRECISE data. 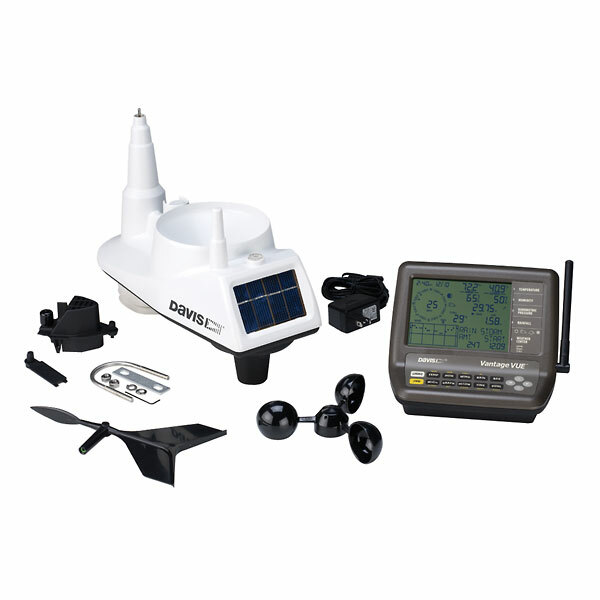 Davis is a prominent provider of weather monitoring, marine, and outdoor equipment and technology. The company has been a part of the manufacturing industry for well over 50 years, boasting innovation, quality, and 5-star customer service. Today, Davis Instruments are wildly recognized by both hobbyists and professionals. With a greater understanding of the pros and cons and the maker of the Vantage Vue, we are now going to explore the many different features that come with this weather instrument. Since this weather instrument is considered a beginner’s instrument, there are additional features and add-ons that may be purchased separately with the Vantage Vue. Weather forecast icons, sunset timelines, and weather trends. The radiation shield is one of the most handy features of this entire product. It’s here that the Vantage Vue can truly perform and calculate the most precise data. This feature protects the device from any form of solar radiation, especially in extreme climates or extreme temperatures. Barometric Pressure – With the Vantage Vue, consumers can track what the barometric pressure is, whether it’s rising or falling, and track it in graphical form. Dew Point – On top of the many other instruments, with the Vantage Vue, consumers can track the dew point. Depending on the consumers needs, the Davis Instrument 6250 Vantage Vue can be used indoor and outdoor. This product comes built with sensor protection, to help during extreme temperatures. This weather instrument can reader temperatures from -40 to 150. As far as humidity is concerned, this product gauges relative humidity from 1-100%. Rainfall – In accordance to Davis Instruments, the rainfall feature is a self-emptying spoon measurement tool that tracks rainfall in .01”. Wind Speed and Direction – Many consumers tout the impressive ability to properly and accurately track wind speed and direction. This can be attributed to the hand compass that is found on the bottom of the physical instrument. When it comes to the installation process of the Davis Instrumental 6250 Vantage Vue, it’s important to know, upfront, that it’s not as easy as the company may promote. In fact, many people who bought the Vantage Vue thought the process would have been like that of a ‘plug and play’; however, to their surprise there was some assembly required, including both the weather instrument and the software and technology. Starting with the physical weather instrument, it has been reported by numerous consumers that it may take between 1-2 hours to set up. From there, the consumer will need to install and setup the desktop console, which will be used for data collection and reporting. Typically, these processes can be relatively easy; however, Davis Instruments does not provide the consumer with a website or any instructions how to navigate this process, making it slightly challenging for those who are not technology savvy. The last part of the whole installation process is for those who purchase the internet connection feature. Now, we cannot go into full detail about how this process will unfold because, given the multiple different service options for consumers, the installation process will depend on the internet connectivity package you choose. Out of the many different facets that consumers need to consider, the performance and accuracy of the Davis Instrument 6250 Vantage Vue should be at the center of the conversation. Reason being, what makes the Vantage Vue such a powerful competitor and a leader in the industry can be found in its ability to perform and collect the most accurate and precise weather information. For beginners, the Vantage Vue comes built with a piece of innovation that allows the instrument to report information and data within 2.5 second intervals. In the industry today, this is the best performance track time in this price tier, and any other price tier for that matter. This piece of innovation permits the instrument to track the latest information and data regarding temperature and humidity. This can be attributed directly to the powerful sensor shielding, which protects the sensors in extreme temperatures, in efforts to provide the most precise information. One area of concern for us when it comes to the accuracy and performance of the Davis Instrument 6250 Vantage Vue is the fact that their 5-in-1 sensor package does not allow consumers to properly position the anemometer. Typically, it’s suggested that anemometers are placed at 33 feet, whereas the regular sensors are located at around 5 feet. With Vantage Vue, the lack of this customization prevents the product from providing information as accurate as the Davis Vantage Pro 2. So, if you are not a beginner and you are seeking professional weather instruments, you might need to scale up the Davis ladder to the next product. While the Davis Insrument 6250 Vantage Vue is paired and created with the option to include internet access, internet connectivity does NOT come with a standard purchase of this weather instrument. It’s imperative to understand this prior to making the purchase. If you are new to the Davis Instruments, there is an additional package known as WeatherLinkIP. This add-on can be purchased and equipped to the Vantage Vue – however, it will increase the total cost of the weather instrument. When you consider that the software and database feels incredibly outdated, you might wonder what are the true advantages of adding internet access. The WeatherLinkIP add-on package provides consumers with a dongle that can be placed on the back of the physical console. Now, when purchasing a WeatherLinkIP, it’s critical to pay attention to all of the options and services, as there are different ones, depending on your specific needs. For example, if you are seeking internet connectivity with Windows versions, you will need to pay extra. Once you decide on a WeatherLinkIP package, the set-up, installation, and integration of the internet are incredibly easy, and beneficial. With internet access, consumers can transfer their information, store the data on their computer, and even create graphics based on your data, thanks to the WeatherLinkIP database and software. On top of this, consumers can even track their information on their cell-phone, if they so choose. The last part of the review process is to consider the costs and affordability. To date, the Davis Instrument 6250 Vantage Vue currently costs $395.00, which, depending on your financial situation, may seem relatively expensive for a beginner weather instrument. On top of this, keep in mind, consumers will need to purchase the WeatherLinkIP feature for internet connectivity. To start, consumers must purchase the base WeatherLinkIP feature. Once you do, there is an option to select from three different packages, all of which come with different features, and costs. Aside from the internet features, consumers also have the option to purchase additional compatible pieces of equipment. For example, consumers may also choose to purchase a Vantage Vue Wireless Console/Receiver, which costs $195.00. There is also the option to purchase Vantage Connect for Wireless Stations, which costs $750.00. With Davis Instruments there are endless options to enhance your weather instrument with additional packages and products. Do keep in mind, each additional package does come at a hefty fee, which sometimes consumers forget. It’s important to evaluate what you need for what you plan to do with the 6250 Vantage Vue. At the end of the day, the one question that many of the readers are asking, including yourself, is whether or not the Davis Instrument 6250 Vantage Vue is worth the cost and features. While the Davis Instrument brand is one of the leading manufacturers in the industry, the Vantage Vue boasts many impressive features, many of which are years ahead of the competition. However, the company has not changed many of the features or database, which can make this product feel slightly older than it really is. In fact, past consumers of the Davis Instrument brand have mentioned that this product is essential the same exact weather instrument as it’s predecessors. Now, where this product truly shines is in the collecting and accuracy of data. At this price range, consumers will not find a better weather instrument that can provide such precise results. Now, with that statement, it’s important to consider that, the Vantage Vue does NOT come with internet connectivity and consumers must purchase this feature on the side, which also increases the total cost of the product. With that in mind, is the Davis Instrument 6250 Vantage Vue worth the initial costs? While there is much that can be improved with this weather instrument, there are no major competitors that can portray any significant contrast. In other words, depending on your budget, the Davis Instrument 6250 Vantage Vue, for the pure accuracy of weather information and data, is most certainly worth each penny. The reality is the Davis Instrument brand is the pinnacle of the weather instrument industry and, owning one of their products is a feat in itself.